Unsure how to sew the new knits so they’ll look great and fit better than ready-to-wear? 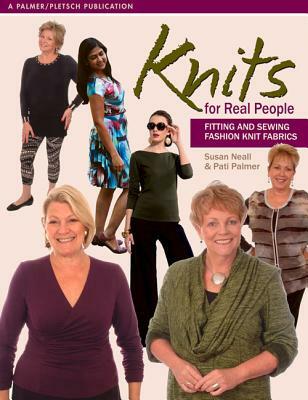 Knits for Real People helps readers sort out the differences in fabric types and explains the fitting and sewing techniques for each. Photographs of knit fashions from McCall’s, Vogue, and Butterick pattern companies provide inspiration throughout the book and illustrate the many types of knits. The many techniques explained include: layout, cutting, and marking; seaming techniques using sewing machines and sergers, including the use of the differential feed feature; creative embellishments, including piping, flounces, “peepers,” and decorative serging; neckline and edge finishes, including bands, collars, and bindings; sleeves, hems and closures; and fitting techniques for tops, pants, and activewear. Knit fabrics are very popular in fabric stores and this book helps people take advantage by teaching how to fit patterns for this versatile material. Susan Neall is the tour coordinator for Sew Inspirational Events. She is a former editor for "Australian Stitches" magazine and a former craft consultant for "Better Homes & Gardens" magazine. Pati Palmer is the CEO of Palmer/Pletsch Publishing, a designer and consultant for the McCall Pattern Company, and an author of "Fit for Real People," "Mother Pletsch's Painless Sewing," and "Pants for Real People." She lives in Portland, Oregon.